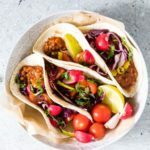 These Easy Mexican Vegan Tacos / Mexican Lentil Tacos are sooooo good even carnivores won't notice they're meat-free. Suitable for Vegan and Gluten-Free diets. Staircases in grand houses make a pretty entertaining few hours for young children, don’t they? All that running up and down them, trying to slide down head first, poking heads through railings, pulling funny faces at rather serious ancestors and shouting ‘mama yook me’ from the top of the stairs as they try to climb a rather expensive and antique looking piano. Luckily there are some very understanding people out there. And our rather fab fun day out was topped up with some easy peasy Mexican Vegan Tacos (or Lentil Tacos as Freddy calls them) when we got back home – bliss. I love, love, love, love, love lentils and beans. Ok, incase you did not get that I seriously loooooooooooooove lentils and beans. Which might explain the five kilos and ten tins of beans, and the 10 kilos of different types of lentils I have in my pantry. So we eat them a lot – in bean cakes and in black-eyed bean stews, in slow cooker lentil curries and lasagnas. In pretty much everything. But this is our first ever taco recipe. Vegetarian tacos rock. When I first suggested making lentil tacos to my (meat loving) OH, his exact response was – can’t we just have real tacos instead, with meat, not lentil tacos? He hesitantly agreed to give it a go after my rather indignant ‘incase you do not realise I have been cooking for you for 10 years and you can pretty much tell that if it turns out crap then I will bin it’. Even mini chef threw in a daddy are you crazy look on my behalf. He loooooooooved it. Which I really got after his third taco – and him gulping down the two leftover tacos the next day. Thank you Mexican cuisine. Instant Pot Arroz con Leche is next on my list and I know he will love that one. Oh and of course Instant Pot Mexican rice. Step 1. Saute the onion and garlic. Step 2. Then add all the remaining ingredients, bring to the boil and reduce to simmer until lentils are tender. Step 3. Keep an eye on the liquid and add some more stock if necessary. Step 4. Adjust seasoning and remove from heat. Step 5. 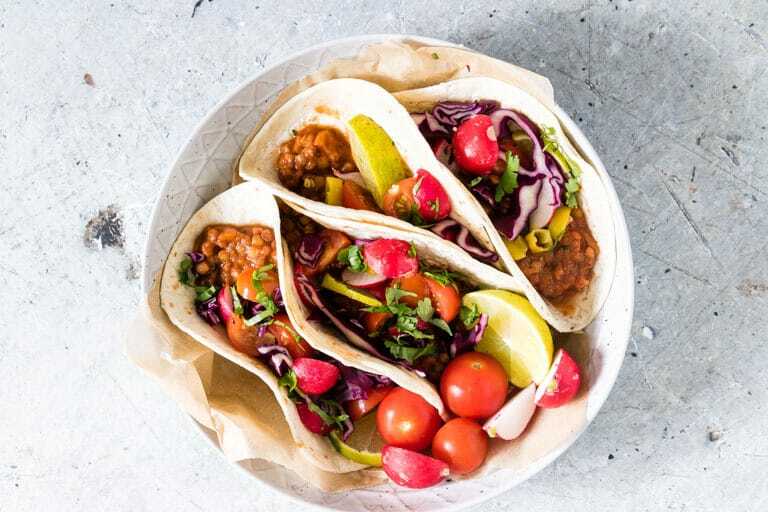 Serve lentils with the tacos and a variety of toppings. 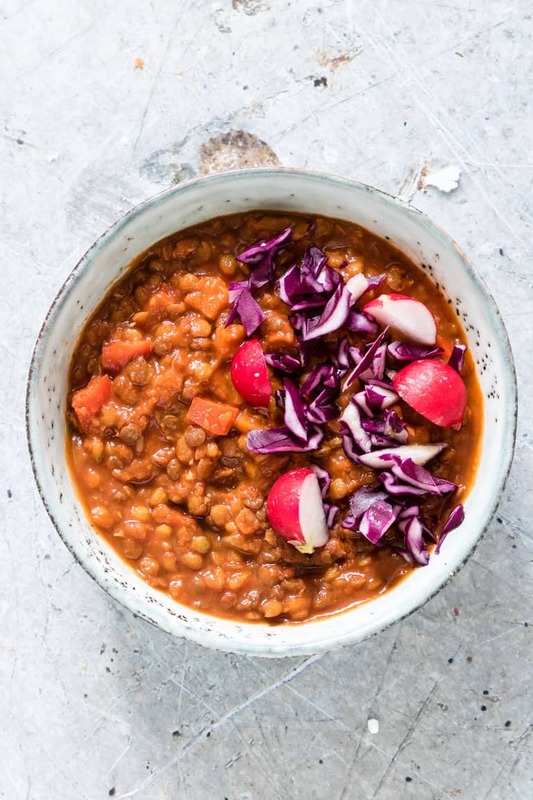 Lentils are a fab source of vegetarian or vegan protein. Each 100g cooked serving of lentils contains 9g protein, a moderate amount of carbs (20g) and almost no fat. 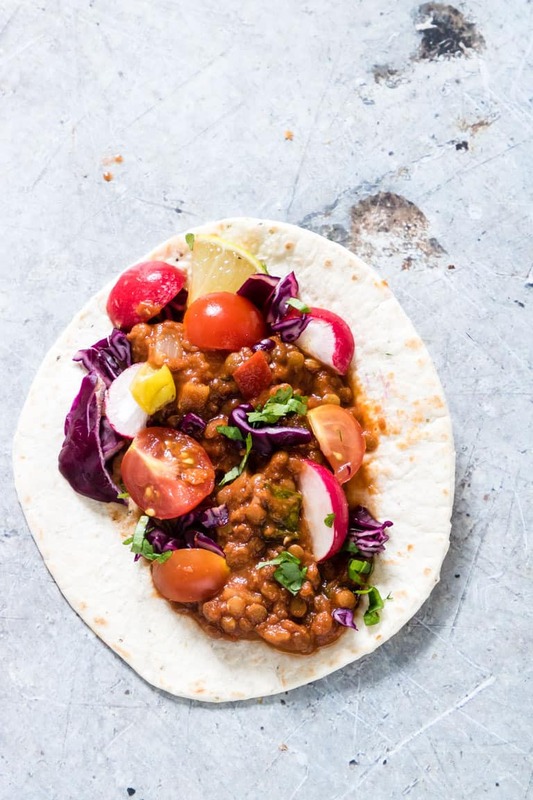 Combined with their hearty flavour, their nutrition profile makes lentils the perfect meat alternative in tacos. 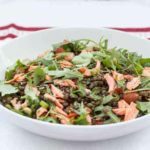 Guys if you love lentils then you could try this red lentil dahl from Veggie Desserts, and this lentil tabbouleh from Jamie Oliver. 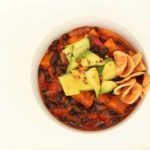 Thank you for reading this Mexican Vegan Tacos recipe post. And please come visit again as I continue dreaming up recipes, traditional African recipes, African fusion recipes, Sierra Leone recipes, travel plans and much more for you. 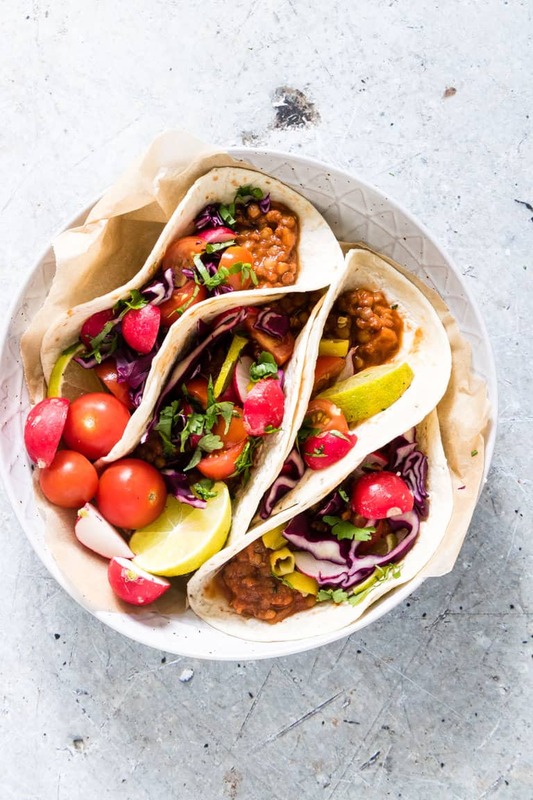 Don't forget to tag #recipesfromapantry on Instagram or Twitter if you try Mexican Vegan Tacos! It is really, really awesome for me when you make one of my recipes and I'd love to see it. You can also share it on my Facebook page. Please pin this recipe to Pinterest too! Thank you for reading Recipes from a Pantry. Heat the oil in a large enough pot and soften the onion and garlic for about 5 mins. Then add in all the remaining ingredients and mix well, bring to the boil and reduce to simmer until lentils are tender. Keep an eye on the liquid and add some more stock if necessary. 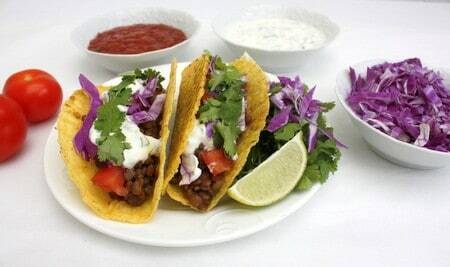 Serve lentils with the tacos and a variety of toppings. Thank you so much for visiting my blog recently. And was thinking the same about these tacos, if you are going to have them have them with meat. But hey the recommendations here from the family have swayed me enough to try the lentil version. No worries Denise. Enjoy the lentils. Thanks GG. The spices really make this dish. What a delightful recipe and such pretty enticing images too! I love the addition of lentils, and I use them a lot in cooking. I am loving lentils more and more and tend to think about them first before anything else. I love pulses too and start to panic if my jar of lentils looks like it’s near to empty. I know I would be happy to eat any number of your tacos – delicious. Hehehehehe. Let’s start a lentil recipe fight. I so hadn’t thought of lentil tacos either but what a great idea. Love lentils but in practice don’t eat them anywhere nearly enough as I should. Pinning your recipe! Thanks Lou. Hope you like this. Love the combination of lentils or beans with tacos and really who needs the meat? The spices and other toppings are what make tacos so tasty and delicious and I’d much rather have lentils… Thank you SOOOO much for your generous mention of the bake sale! This is greatly appreciated and a big help in getting the word out! No worries JV. Good luck. He he! Brilliant, I would love these too. Yum!! Might be making them again tonight J.
Lentil tacos? Oooo this sounds exciting. I would love to try it now!! 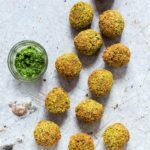 I wonder if you can think up a lentil dessert Z.
I’m a huuuuge fan of lentils too – these look amazing! Thanks N. Nice to meet you. Awwwwwwwww. They are so sweet. Yum, these are going on my ‘to try’ list!!! These look so yummy! I love vegetarian tacos. I make crispy potato tacos and lot and more recently have been making baja style grilled tempeh tacos with a recipe from Veganomicon. So good! Tammy I need to know more about those crispy potato tacos. What a great idea! 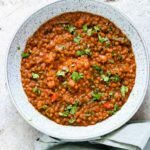 I love beans and lentils and I love chilli, so love your recipe. 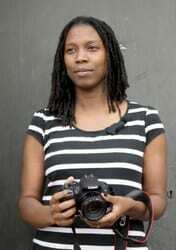 Yaye, let me know if you try it J.
I love the “white” white you’ve managed to get in your photographs. I always struggle getting that correct shade of white. I know exactly what you mean Morgan. Vegetarian tacos with lentils? Yes please! what lovely bright and vibrant tacos! Beautiful! 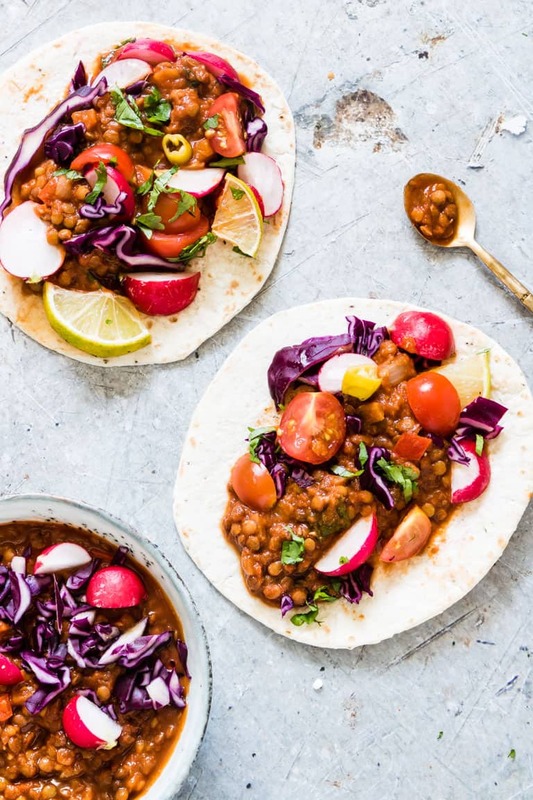 I love lentils too and these tacos look fabulous Bintu! I made these tonight and they were so amazing I ate 5 of them. I’m now laying here with a belly too full to do anything else, but they are so worth it. I added a pinch each of oregano and marjoram as my dried herbs and also a small bay leaf. I’m a huge lover of spicy food so I also tossed in one and a half chipotle peppers (diced). I have so much leftover (as I was only cooking for myself) but I’m thrilled because I’ll get to have this for lunch tomorrow. Thanks for sharing your recipe!! Thanks so much for coming back and telling me about making this dish. Enjoy the lovely belly full feeling.